SoS On The Net offers you the unique chance to start building your own website at your own pace. Its quick and very simple to do and once you have built up all the content information and photos you can either just sit back and marvel at what you have achieved on the net, or contact us and have one of our experienced web design team give it a complete professional design makeover. 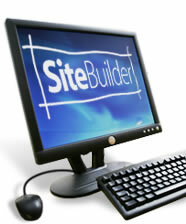 In Just 5 simple steps after purchase you could have a web site published in minutes.